Last evening the Cliff-Cannon Neighborhood Council held its second tree walk. There were three trees nominated for the title of 2011 Tree of the Year and Judy Gardner worked out a 45-minute tour along beautiful streets. We had a cedar, a maple and an ornamental cherry to choose from. As a bonus, Ed Lester, a Spokanite who is building an inventory of the biggest trees in the area, joined us and pointed out other trees along the way and answered lots of questions. When we got back to the meeting place at Roosevelt School, the voting, led by children in the neighborhood, was held. 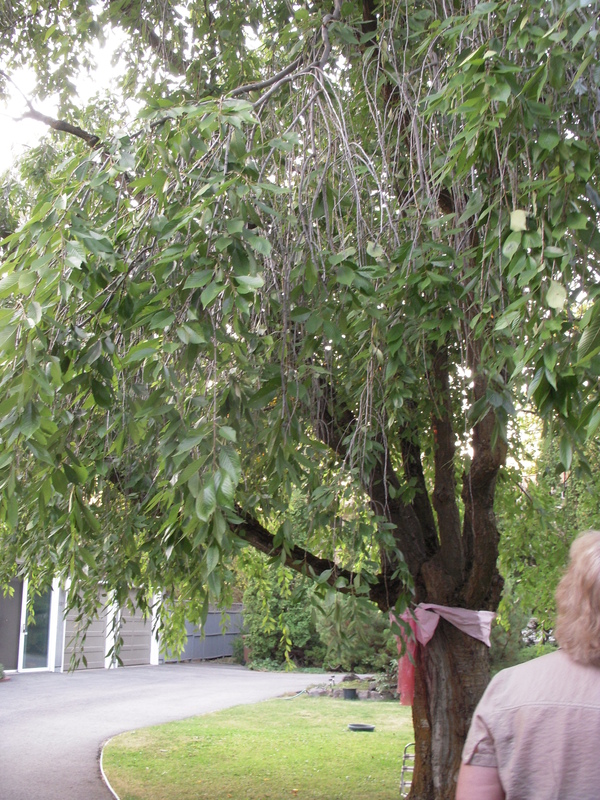 AND THE WINNER IS: – wait for it – wait for it – the ornamental cherry owned by Evelyn Creager. She put out a flyer with pictures of her tree in full bloom and encouraged her neighbors to go on the walk and vote for her tree. As the winner she will choose where she would like to plant a Susie tree in the neighborhood. So, stay tuned to find out where that tree will be planted.